Oscar Matson, the patriarch of Shasta County’s oldest bonded winery, was not always a winemaker. That happened by chance. Before winemaking, he spent several years teaching modern languages—French, German, Spanish, and English—at Shasta College in Redding and, with his wife Stella, raising a family of four boys. In the 1960s, perhaps thinking of his boys and his retirement, he seized the opportunity, with two other families, to purchase eighty-one acres of land adjacent to Redding. The group divided this land on Arapaho Drive near the bridge over Salmon Creek into three twenty-seven acre lots, one lot for each family. The family’s portion is now thirteen acres and the site of Matson Vineyards. Gary Matson, whose green thumb and community organizing skills helped create the community gardens in Happy Valley and launch the Redding Farmers’ Market, planted some Colombard grapes on his Happy Valley property, and Oscar’s extra bedroom soon housed their fermentation. In the ‘90s, Gary and his partner were murdered on their Happy Valley property in a senseless hate crime, but Oscar and Roger credit Gary for the adventurous spirit behind their wine odyssey, Oscar referring to Gary as a universalisch, a term that brings together his agricultural, community, and musical talents. A horticulturist educated at Davis, Gary noticed the good soil on the Arapaho Drive property and planted grapes when the house was built in 1981. Today the operation of the vineyard is in the hands of the youngest son, Roger. After graduation from high school, Roger’s first choice for higher education would have been a program related to wine-making, but he somehow thought that only wine-making families with roots in the Napa Valley gained entry to that route. So he went to UC Santa Cruz, “willing to brave the winds” with an undeclared major taking courses like linear algebra, physics and organic chemistry. This prepared him to complete a B.S. in fermentation science from the University of California at Davis in 1980. Roger honed his winemaking skills in Mendocino County with wineries Olson (later Conrad and now Fife), Parson’s Creek, and Kendall-Jackson. 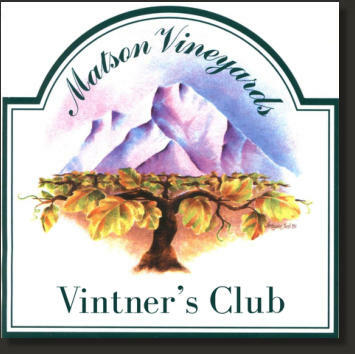 Roger figures prominently in what Greg Butler, the President of the Shasta-Cascade Viticulture Association, identifies as the uniqueness of Matson Vineyards: its blended wines.